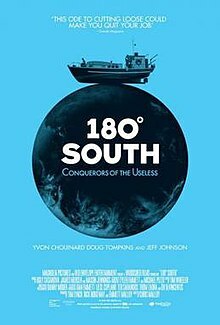 180 Degrees South: Conquerors of the Useless, or simply 180° South, is a 2010 documentary directed by Chris Malloy that covers the journey of Jeff Johnson as he travels from Ventura, California to Patagonia, Chile retracing the 1968 trip that Yvon Chouinard and Doug Tompkins took in their Ford E-Series Econoline Van. After finding footage of the 1968 expedition, Johnson decided to make climbing the Corcovado Volcano in Patagonia as his life goal and, after speaking to Chouinard and Tompkins, planned his own journey. The subtitle of the film comes from Lionel Terray's mountaineering autobiography, Les Conquérants de l'inutile (1961). The film emulates the 1968 trip made by Yvon Chouinard and Doug Tompkins to Patagonia, but rather than by land, Jeff Johnson travels by sea from Mexico and south along the west coast of Chile. The film opens with original home movie footage as taken by Chouinard and Tompkins, and then continues with Johnson's own footage, in which he includes surfing, sailing and climbing as the film follows Johnson signing on with a small boat heading for Chile, his being delayed for several weeks on Easter Island, his meeting travel partner Makohe, and in his reaching Patagonia, Johnson meeting with Chouinard and Tompkins. The film concludes with his attempt to climb Cerro Corcovado (the Corcovado volcano), an attempt that was halted 200 feet from the summit out of concerns for safety. The film debuted February 10, 2010 at the Santa Barbara International Film Festival, followed in April 2010 by limited theatrical release, as well as festival screenings at the Newport Beach International Film Festival. The film was released on DVD and Blu-ray in June 2010, followed by additional festival screenings in September 2010 at the Asbury Park Independent Film Festival, in November 2010 at the Banff Film Festival and Save the Waves Film Festival. The film had theatrical release in Japan in January 2011. Seattle Post Globe wrote "180° South is a thinking person’s adventure film, one that stimulates the mind rather that the adrenal gland," in that it "is not one of those extreme sports movies set to heavy metal music in which daredevils boast of pitting themselves against nature." The reviewer notes that while the film instead has a message of conservationism, the director "does not pitch this conservation message in a fit of hysterical propaganda, as have the directors of so many ecological horror documentaries on topics ranging from global warming to the corn syrup in our peanut butter." He writes "The regard for the planet shown in 180° South comes from the quiet, philosophical nature of the people profiled in the film, who realize there is more adventure in the preservation of nature than in its conquering." Minneapolis Star-Tribune praised the film by writing "If you are this close to chucking it all in, packing your bags and going vagabond, by all means do not see "180° South." Director Chris Malloy's eco-tourist documentary could stoke your wanderlust to the point of no return." They noted that the cinematography tended to meander at times and did not allow the viewer to learn much about Johnson himself, but that the film began to "brighten" after Johnson meets with Chouinard and Tompkins at the wildlife preserve that Tompkins founded in Patagonia in 1991. Spectrum wrote that the beginning of the film was deceptive in that its initial "Conversations of high adventure spliced between footage of rock climbing, surfing and mountaineering may easily trick the viewer into thinking this is a film about extreme sports," but that the "main clue that hints at a different purpose is the chill sound track." They expanded that it was not until after Johnson's unscheduled delay on Easter Island that viewers "first learn what 180° South is most obviously about," when "the theme of ecological conservation is played out in conversations about national parks, hydro-electric dams, indigenous wildlife, sustainable farming, consumerism, commercial fishing, reforestation and even development models." They note that the final two-thirds of the film shares the "intrinsic tension between conservation on the one hand and the mass-produced technological innovations that make the trip and film possible on the other". The Washington Post writes "Chris Malloy's film strikes so deeply into the heart of Patagonia's wilderness we come to feel at home there". ^ 180 Degrees South on DVD. Interview with Yvon Chouinard in bonus materials, "Making of 180° South". ^ Vizcarrondo, Sara Maria (May 28, 2010). "The final, barren frontier: 180 South". Boxoffice Magazine. Archived from the original on 2012-03-21. Retrieved April 12, 2011. ^ White, Bill (May 19, 2010). "Film Review: "180° South" An Adventure for the Thinking Person with an Ecological Heart". Seattle Post Globe. Retrieved April 12, 2011. ^ Covert, Colin (May 20, 2010). "Review: 180 South a trip to Earth's outer reaches". Minneapolis Star-Tribune. Retrieved April 12, 2011. ^ Jeff Boyd (27 July 2010). "180° South: Travel, Extreme Sports, Adventure...The Environment". Spectrum. Retrieved April 12, 2011. ^ "review: 180 South". Washington Post. Retrieved April 12, 2011. This page was last edited on 14 February 2019, at 12:46 (UTC).